You will use several instruments to help with navigation in an old school, new school mix. For the South Pole, detailed maps are made by U.S. Geological Survey (USGS). Order at http://mac.usgs.gov/isb/pubs/forms/anarctic.html If you are going from Hercules Inlet to SP any decent Antarctica map should do fine. Cut it down to relevant sections to save weight. For the North Pole, there are maps showing the underwater ridges that affect ice drift, but you don't need maps for the ice except for plotting positions. Make and bring photocopies of relevant sections of your route. Bring several compasses and GPS units. Garmin, deLorme and Silva handheld GPS are the most widely used. Garmin's Etrex family is more user friendly, but the Silva takes the cold better. Both give barometric pressure and indicate weather changes. Garmin also provides altitude measurements using both satellite positioning and barometric pressure, but the readings fluctuate a bit too much. In addition to your position, the GPS will also calibrate your distance (total and daily) plus your speed. At the North Pole it will show your current drift. Carry the GPS on you at all times, the liquid screen will crackle up in severe cold. Calibrate your GPS just as you arrive at the ice. If the GPS dies, you are out of the game unless you know solar navigation. Bring a spare and enough batteries. (Around 1 load change each week). Almost all expeditions are now tracking with InReach from deLorme. Units are cheap and very reliable. 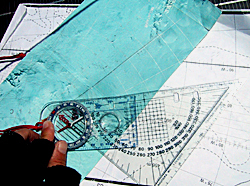 You will need a notepad, map, ruler and pencils (ballpoint pens freeze) to track your positions and progress. Calibrate the GPS in the morning and read it at night, taking down your position on the map. Make lines between entry points with a ruler to check how straight you travel. Another good place to note your position is the tent wall. Use a permanent marker pen and write date, day, time, position, travel hours, distance today, distance total, weather and other remarks. This graffiti will become very important to you. Just as the old POWs used to mark the walls of their underground prison cells to keep track of time, your notes will help you to track time and feel progress in the travel monotony and perpetual daylight of the poles. www.humanedgetech.com helps with online maps with automatic tracking and polar stereographic projection.